Published: Nov. 25, 2012 at 05:27 p.m. Updated: Nov. 26, 2012 at 11:21 a.m.
Minnesota Vikings defensive end Jared Allen might hear from the NFL this week because of his blind-side block during teammate Antoine Winfield's interception return in Sunday's 28-10 loss to the Chicago Bears. 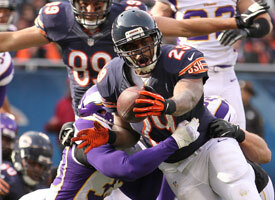 Check out the best photos from the Week 12 matchup between the Vikings and Bears. In the clip above, you clearly can see Allen launching himself and hitting Bears guard Lance Louis in the head or neck area. No penalty was called, but Fox's Mike Pereira believed one should have been. Allen believed it was a clean play. "I turned around, he was running to make a tackle and I threw myself into him to make a block," Allen said, via The Associated Press. "My condolences to him and his family. I never, ever, try and intentionally hurt anybody." It's true that Allen doesn't have a long history of fines related to hits to the head. He was fined in 2008 for a low hit on Houston Texans quarterback Matt Schaub. So we'd expect Allen to receive a hefty fine for this hit, although a suspension wouldn't make sense because he's not a repeat offender. We contacted the NFL for comment on Allen's hit but have yet to hear back.